Microfracture treatment of the knee is a surgical procedure that is performed to treat damaged knee cartilage which acts as a cushion between the bones and joints. The goal of the knee microfracture procedure is to help prevent further cartilage damage and stimulate new growth. This procedure can help a patient avoid partial or total knee replacement (or delay the need for it), progressive knee arthritis and further trauma to the cartilage. In a microfracture procedure, a Phoenix knee surgeon creates small holes on the damaged subchondral bone. This knee bone does not get sufficient blood flow which makes it difficult to heal when injured. By penetrating the hard bone, the microfracture is able to go deeper into vascular bone where it can reach the surface layer. Thanks to the microfracture holes, the deeper bone marrow tissue is able to access the surface layer to provide more blood supply and cartilage building cells to regenerate the damaged cartilage. This procedure can be performed using three types of anesthesia. These are: general anesthesia, regional anesthesia or a sedative and pain killing medication to numb the knee. It is a minimally invasive procedure. The microfracture procedure works well in most cases as it helps relieve knee pain substantially. 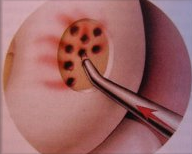 However, there are concerns that the procedure does not stimulate cartilage growth of the normal joint. It’s important to note that there are different types of cartilage and one of these is the hyaline cartilage which is located in the joint surface. The microfracture mainly stimulates cartilage growth of fibro cartilage which is normally found in scar tissue. Fibro cartilage is not as tough or resilient as the hyaline cartilage and this means that there are chances that the procedure may not be quite effective over time. Not all patients with knee defects are good candidates for this procedure. If you have widespread arthritis of the knee, are inactive and cannot follow rehabilitative care procedures; this surgery will not be helpful to your condition. 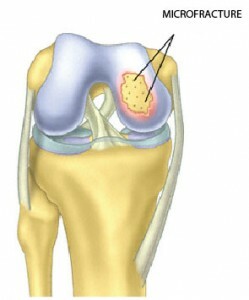 However, patients who have cartilage damage on limited areas of the knee can benefit greatly from the procedure. 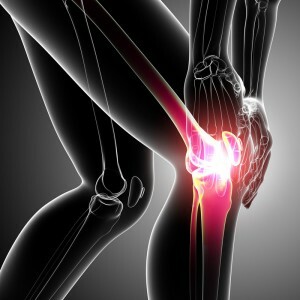 It is also helpful to patients who suffer from knee pain or swelling brought about as a result of the damaged cartilage. If you live an active life and are not able to participate in sporting activities due to cartilage damage, this surgical procedure could help. The knee microfracture treatment has produced good results. Many patients are able to go back to their normal active lifestyles after the surgery. That said; the surgery is not a complete fix and athletes in particular may not be able to ever return to intense sporting activities. The recovery after the procedure is slow and could take between four and six months. The procedure is most effective on younger patients who are below the age of 40 and patients with normal weight.